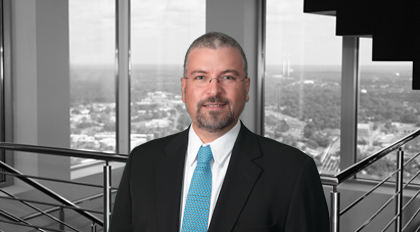 Todd Muldrew is counsel with the Public Affairs team at the Charlotte law firm of Moore & Van Allen. Muldrew advises corporate clients on compliance with state and federal political law and regulations regarding campaign finance, lobbying and ethics. Muldrew works with his clients to develop and implement comprehensive communication strategies targeted at influencing government action and thought-leaders. Muldrew accomplishes this through the writing and production of books, speeches, print and commercial broadcast advertisements, video and other media. He assists his clients in promoting their environmental, energy, and economic policy agendas with these tools. Muldrew has a M.S. in Communications from the University of Tennessee and received his J.D. from the William & Mary School of Law. Prior to joining Moore & Van Allen, Muldrew refined his skills in legal research, writing and federal procedure while serving as a judicial clerk to the Honorable Raymond A. Jackson, United States District Court, Eastern District of Virginia. He is a member of the ABA Government Affairs Practice Committee and the Public Affairs Council.